Immanuel Kant (22 April 1724 – 12 February 1804) was a German philosopher who is widely considered to be a central figure of modern philosophy. He argued that human concepts and categories structure our view of the world and its laws, and that reason is the source of morality. His thought continues to hold a major influence in contemporary thought, especially in fields such as metaphysics, epistemology, ethics, political philosophy, and aesthetics. Kant's major work, the Critique of Pure Reason (Kritik der reinen Vernunft, 1781), aimed to resolve disputes between empirical and rationalist approaches and to move beyond what he took to be failures of traditional philosophy and metaphysics. The book was placed on the Index Librorum Prohibitorum. The philosophical concept of the sublime, as described in the Observations on the Feeling of the Beautiful and Sublime, took inspiration in part from attempts to comprehend the enormity of the 1755 Lisbon earthquake. A humorous way to be introduced to Kant is La vie sexuelle d'Emmanuel Kant (1999) by Jean-Baptiste Botul. Immanuel Kant was born in 1724 in Königsberg as the fourth of nine children (four of them reached adulthood). In his entire life, he never traveled more than 10 miles from Königsberg. It is often held that Kant lived a very strict and predictable life, leading to the oft-repeated story that neighbors would set their clocks by his daily walks. He never married. However, there were women in Kant's life for which he had an affection (and vice versa). Documented affections are Caroline von Keyserling, Maria Charlotte Jacobi, and Charlotte Amalie von Knobloch. It is not known if any of these affections were consummated. Kant lived together with a manservant Martin Lampe for forty years (1762-1802). Kant did not seem to lack a rewarding social life — he was a popular teacher and a modestly successful author even before starting on his major philosophical works. Kant developed his moral philosophy in three works: Groundwork of the Metaphysic of Morals (1785), Critique of Practical Reason (1788), and Metaphysics of Morals (1797). Kant lectured on anthropology for over 25 years. His Anthropology from a Pragmatic Point of View was published in 1798. (This was the subject of Michel Foucault's doctoral dissertation.) Kant's Lectures on Anthropology were published for the first time in 1997 in German. The former was translated into English and published by the Cambridge Texts in the History of Philosophy series in 2006. Kant was among the first people of his time to introduce anthropology as an intellectual area of study long before the field gained popularity. As a result, his texts are considered to have advanced the field. 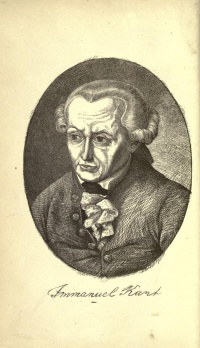 Kant’s point of view also influenced the works of philosophers after him such as Martin Heidegger, Paul Ricoeur, and Jean Greisch. Kant viewed anthropology in two broad categories. One category was the physiological approach which he referred to as “what nature makes of the human being”. The other category was the pragmatic approach which explored the things a human “can and should make of himself”. Marquis de Sade was born 16 years after Kant. Altough he probably never read Kant, his philosophy turns out to be antithetical to Kant's. One of the essays in Max Horkheimer and Theodor Adorno's Dialectic of Enlightenment (1947) is titled "Juliette or Enlightenment and Morality" and interprets the ruthless and calculating behavior of Juliette as the embodiment of the philosophy of enlightenment. Similarly, psychoanalyst Jacques Lacan posited in his 1966 essay "Kant avec Sade" that de Sade's ethic was the complementary completion of the categorical imperative originally formulated by Immanuel Kant. Slavoj Zizek even went further in Kant and Sade: The Ideal Couple when he dared to ask whether there is "a line from Kantian formalist ethics to the cold-blooded Auschwitz killing machine?" (1784) "An Answer to the Question: What Is Enlightenment?" (Beantwortung der Frage: Was ist Aufklärung? Unless indicated otherwise, the text in this article is either based on Wikipedia article "Immanuel Kant" or another language Wikipedia page thereof used under the terms of the GNU Free Documentation License; or on original research by Jahsonic and friends. See Art and Popular Culture's copyright notice. This page was last modified 08:56, 28 March 2019. This page has been accessed 11,359 times.